There is a story in the Gospel of John about a wedding that Jesus attended. When the host of the celebration unexpectedly ran out of wine, Jesus performed his celebrated "miracle" in which he turned water into more wine. The demon Haagenti's specialty is turning water into wine, and, and if anybody wishes, wine back into water. He also can turn any metal into gold and make men wise by instructing them in every subject. These are relatively amazing feats for a spirit that presents itself as a red bull with wings. At least this is how the old magicians saw him. The old master, Johann Wier, wrote that Haagenti comes up "appearing like a great bull, having the wings of a griphen (sic)." The spirit can change into a human form if it chooses, although the body remains red in color, the old ones say. In demonology, Haagenti is rated as a great president of Hell. 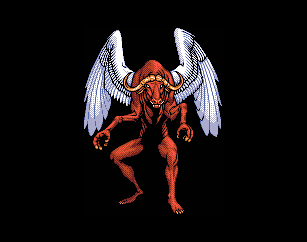 As the forty-eighth Spirit of the Goetia, he rules over 33 legions of demons.